Nano is assuredly of incredible small size but its beauty is its real perfection, potency and wide range of applications. Therefore, nanomaterials and nanotechnology have become a fundamental arena of scientific activities because of their enormous applications especially their roles in environmental monitoring and remediation. The inimitable properties of nanomaterials make them suitable for the removal of pollutants from the environment and ultimately cleaning up the environment. The unique properties of nanomaterials are mainly due to their extremely small size, typically in the range between 1 and 100 nanometres, creating a large surface area in relation to their volume and these properties makes them highly reactive with high capacity and better recyclability. Thus nanomaterials provide high surface area, high capacity, well defined structure, high reactivity, insolubility, good chemical and thermal stability, can be easily recycled, with fast sorption kinetics and readily tailored for application in different environments and these properties make them unique for developing a new generation of efficient, cost effective and environmentally acceptable functional materials for water treatment processes compared to non-nano forms of the same materials. Environmental pollution treatment by nanomaterials is one of the emerging fields which is becoming important day-by-day because of the current and increasingly establishment of the industries. Majority of the industries uses various toxic organic and inorganic chemicals. These industries discharge their toxic and used chemicals to the nearby water streams which pollutes the aquatic world as well as indirectly influences human’s life. Therefore, scientific awareness and methods are needed to overcome the mentioned challenges. Being a subject of key interest, it was thought to summarized the cutting edge research on nanomaterials utilization for environmental challenges in the form of a book. The book is composed of eight chapters. 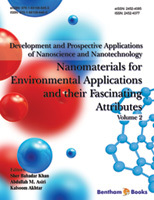 The first chapter is related to different treatment techniques of environmental pollutions using nanomaterials. It highlighted how to resolve the old challenges with new solutions, reviewed different methods used for environmental remediation and highlighted the importance of nanomaterials in environmental remediation. The second chapter is related to nanotechnology for safe and sustainable environment. Nanotechnology is one such revolutionary and state-of-the-art for environmental protection, remediation and pollution prevention. This chapter is set to explore the role of nanotechnology in regard to safe and sustainable environment, which can truly be regarded as a “Realm of Wonders”. In the third chapter, basic concepts of photocatalysis are explored. Various parameters which control and influence the photocatalytic process are studied in relation to the mechanistic approach. Nanomaterial such as metal oxides and some new types of materials, like perovskite and metal organic framework, (MOF) are used as efficient photocatalyst. The role and mechanism of these materials have been discussed. All these nanomaterials are used for the environmental remediation, dye sensitized solar cells, air purifications, hydrogen production and self-cleaning process. In the fourth chapter, the role of clay based nanocomposites for environment protection is presented. In particular, the removal of heavy metal ions, toxic organic compounds, hazardous dyes and antibiotics from aqueous environment has been discussed and recent studies are summarized. Purification and remediation of contaminated soil and air with the help of clay based nanocomposites are also discussed. The fifth chapter deals with the introduction of cation exchange materials especially nanocomposite cation-exchange materials, the drivers for green technology. This chapter also describes nanocomposite cation-exchange materials with their technological improvement from old era to the latest age of nano because green chemistry can be applied to real processes. The sixth chapter describes the synthesis of iron oxide and its derivative nanoparticles and their wide scale applications. This chapter summarizes comparative and brief study of the methods for the preparation of iron oxide magnetic nanoparticles with a control over the size, morphology and the magnetic properties. Some future applications of microwave irradiation for magnetic particle synthesis are also addressed. The seventh chapter reviews relative and comprehensive techniques for the preparation of polymeric membrane in cooperated with typical additives and their influence on membrane significant in terms of permeability and selectively. In addition, the recent development in polymeric membranes loaded with nanoparticles for evaluating their properties against biofouling. The eighth chapter offers a brief knowledge about the nanocatalyst for the removal of organic toxins, for instance nitrophenols and dyes, which are at alarming condition. This chapter also deals with the use of metal oxides and layered double hydroxide for the removal of these organic pollutants. Metal oxides and layered double hydroxide worked as a solar catalyst for the removal of contaminant and also how various support work enhance its catalytic performance of these materials. Nanocatalyst on a solid supported materials are also explained in this chapter, which avoids them from aggregation and ease separation after the reaction, which are highly demanded at the industrial level. We believe that this book will properly convey the savor of the nanotechnology and their approaches toward environmental challenges. We intently anticipate that this book will be beneficial for students, teachers and practitioners.